Harrisburg, Penn. 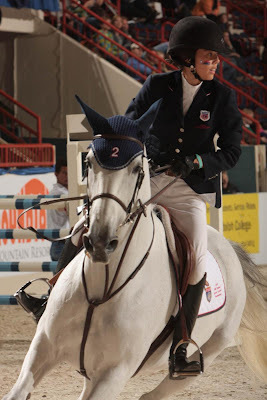 - October 16, 2010 - The exciting Pennsylvania National Horse Show junior jumper action culminated with the $7,500 Randolph College/USEF National Junior Jumper Individual Overall Championship awarded to the rider with the least faults after three phases of competition. In the 18-horse field, two riders entered tonight's competition fault-free and both remained fault-free. Those two riders then entered a two-horse jump-off to decide the Gold and Silver Medals. In the end, New York's Karen Polle and Cachette Z took home the Gold. Taylor Land of Alpharetta, Ga. and her Karonda V Schlosslihof CH began the jump-off with a long-strided gallop and took a tight short cut, but the speedy chestnut mare took down two rails for eight faults, stopping the clock in a fast 28.876 seconds. "When Taylor was going clean I was really nervous," said Polle, who watched her challenger jump first. "When I saw her cut the inside turn I thought if I had to do it I would, but after she had two rails I went for a clean round and was conservative. I never expected I would do so well here!" Polle's plan worked well and she went clean until dropping a rail at the last of the seven jump-off fences for four faults in 33.538 seconds. Polle, a popular rider with her peers, as well as trainers, has had the grey mare, Cachette Z, a little over a year. "She is super fast and really game. She can pull hard right and sometimes gets close to the standard so I have to watch that," she added with a smile. Taylor Land and her Karonda V Schlosslihof CH took home the Silver Medal and Meg O'Mara and Sinatra IV won the Bronze Medal with just two faults. The William C. Steinkraus Style Award was presented by Karen Healy Stables to Jocelyn Neff of Zone 10. The award is presented to the Prix de States Junior Jumper rider who best exemplifies the American style of equitation, and the respectful, dignified, courteous and workmanlike manner of a true sportsman. Neff, of California, rides Gaja 20. The High Point Small Junior Hunter award was presented to Don Stewart's Falcao ridden by Hasbrouck Donovan. 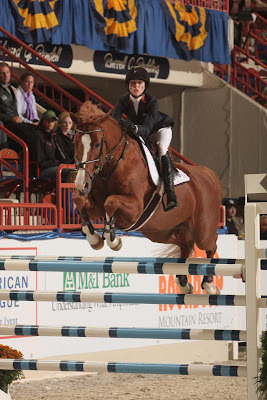 The High Point Large Junior Hunter award was presented to K & S Show Services' Garfield, ridden by Samantha Schaefer. Both awards were sponsored by Brookway Stables. Garfield was also named the Grand Champion Junior Hunter Champion. Garfield is trained by Kim Stewart, who was also honored with the Junior Hunter Trainer Award. Not only was Don Stewart Stables full of winning horses and riders on Junior Weekend, but they were the best decorated and received the Junior Weekend Tack Room Award. The Junior Hunter Rider Sportsmanship Award, sponsored by Pessoa, which recognized the competitor that exhibited the highest degree of exemplary personal conduct with respect to good sportsmanship, went to Reid Patton of Nashville, Tenn. Finally, the Best Junior Rider, Horse award (sponsored by the Reid Family) was presented to Hannah Goodson-Cutt of Los Angeles, Calif. Junior weekend wraps up Sunday with the USEF/Pessoa Hunter Seat Equitation Finals presented by Randolph College. 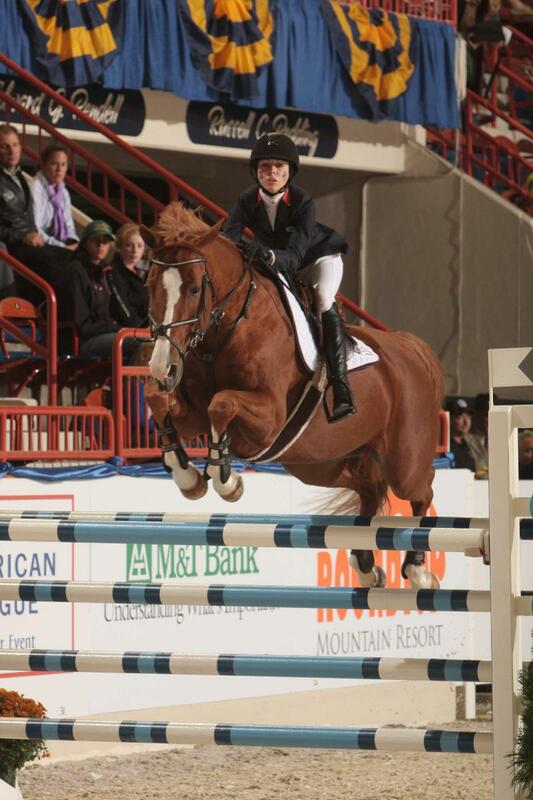 The world-class equestrian competition will then continue through Saturday, October 23, at the Pennsylvania State Farm Show Complex in Harrisburg.